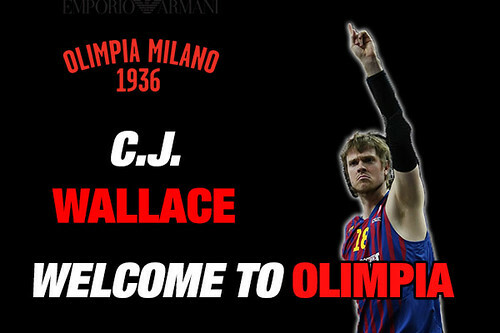 Olimpia: here is CJ Wallace! Pallacanestro Olimpia EA7 – Emporio Armani Milano agreed on a two-year contract with C.J. Wallace, power forward-center, 2.06 mt. tall, born in Atlanta in December 31, 1982, holder of a congolese passport, who spent the last couple of seasons in Barcelona. COACH BANCHI’S OPINION – “The signing of C.J. Wallace allows us to add to the roster a solid, consistent player, who already knows our league and one who made during the last two seasons a very valuable experience playing for FC Barcelona also in Euroleague”. NOTES – Among the former Princeton graduates who played for Olimpia, it’s necessary to mention Mason Rocca, a team’s former captain, and Sidney Johnson, who eventually became Princeton’s head coach… In Princeton, he played 102 games in 4 seasons, winning the Ivy league in 2002 and 2004. In 2003, 2004 and 2005 he was named in the three All-Ivy best teams… In Capo d’Orlando, he played with Drake Diener and his coach was Meo Sacchetti: both now are in Sassari… When in Treviso, Alessandro Gentile was playing in the youth teams of that club… In his Treviso first year, Benetton reached the playoffs semifinal. Both in Italy and Spain his teams never failed to make the playoffs, including Gran Canaria… In 2012 he also won the Spanish Supercup and the Catalan League with FC Barcelona.